Ever night, London's memory resets, and she is unable to remember anything from her past. Instead, her only "memories" are of what will happen in her future. Life isn't easy for London, but she has a supportive mother and best friend, and diaries filled with notes and memories to remember her past, so she gets by. Then she meets Luke. He's not in any of her future memories, yet she encounters him day after day, until he's her boyfriend. London might be willing to overlook this strange occurrence, except she keeps having strange and tragic dreams that don't seem to fit into her future. Now London is forced to face the fact that with Luke, she is beginning to remember a painful past that's been long forgotten. 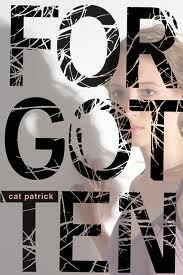 Cat Patrick's Forgotten is a strange, twisty tale that keeps you thinking and guessing all the way through. London's memory issues are fascinating, along with her knowledge of her own future and her routines to get herself through the days. And Luke is a pretty fantastic character—he's understanding, funny, and cool, even when he doesn't understand London's behavior, which can be pretty peculiar at times. London sees him as if it's the first time every morning, which can be an interesting perspective and makes their relationship even more entertaining. The book does turn a bit mysterious and foreboding as London begins to have memories of a funeral and must figure out when in time it is set and who it was that died. She also grapples with the idea that she can't change those memories she does have of the future, but she does slowly begin to take charge of her life when she realizes that her new memories are from the past, and perhaps she doesn't have to live the way she does for the rest of her life. Though the ending is a bit too rushed and doesn't allow the reader nearly enough time to wrap their head around the conclusion, Forgotten does have such a cool concept, with some creepy memories, a fascinating mystery, and some interesting relationship drama. Patrick's writing and her characters are addictive, and it's hard not to read this book in one sitting. Cover Comments: I really like how the title dominates this cover, it's very cool. And the girl in the background with the black, gray, and purple color scheme is very attractive. I like how her shadow is visible against the gray. Very nice.